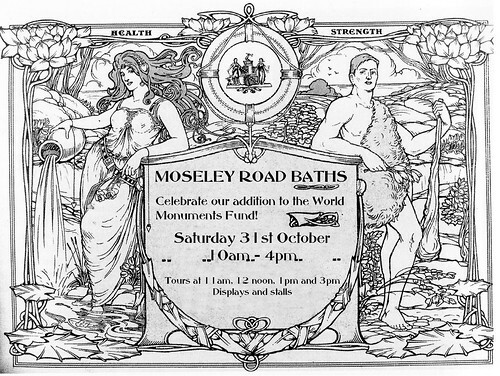 To mark Moseley Road Baths’ recent inclusion on the World Monuments Fund Watch List as well as the building’s 108th birthday, the Friends of Moseley Road Baths are holding an Open Day on Saturday, October 31st 2015 from 10am-4pm. Moseley Road Baths Open Day gives the public a chance to learn about the history of this threatened Grade II* listed building, with access to normally closed areas such as the gala pool, private washing bath departments, laundry room and cold-water storage tank, as well as the boiler and filtration rooms. A highlight of the day comes at 2pm with a re-enactment of the opening ceremony following which Edwardian-period musical entertainment will be provided in the tea room and birthday cake partaken. Later, at 3pm, members of the general public who so wish may undertake a guided tour of the building. For those unable to attend the re-enactment, additional guided tours will take place at 11pm, noon and 1pm and pre-booking is advised. 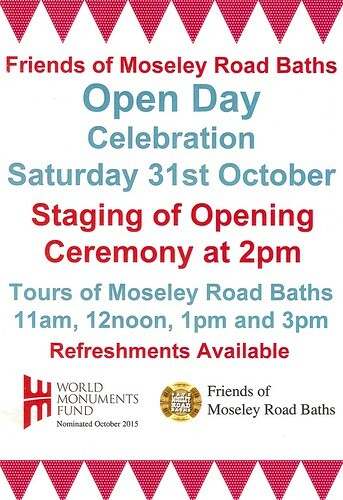 Entrance to Moseley Road Baths Open Day is free, and refreshments will be available in return for a small donation to the Friends of Moseley Road Baths. Additionally, Pool of Memories, the Friends’ book on the history of the baths, will be on sale for £10. Please note that Pool 2 will be open for public swimming throughout the day and those who have never previously swum at Moseley Road Baths are especially welcome to come along and enjoy a dip in this historic Edwardian pool that Birmingham City Council currently intends to close at the end of 2016. Moseley Road Baths is both a local and national asset under threat of closure. How can we are book a tour? Apologies! Please e-mail your preferred time to contact@friendsofmrb.co.uk with your name and the number of attendees.